How will disruptive technology change education? Considering that 10 years ago very few students carried smartphones, and tablets didn’t even exist, it’s impossible to look 20 or 30 years into the future. It is likely, however, that cloud-based technology will be the foundation for educational technology and that remote, online learning will continue to grow at a faster pace. Will the developing world catch up with the developed world? Will residential colleges be as popular as they are today? And what about degrees…will they still mean something to employers? For me, the future of technology in education is the cloud. 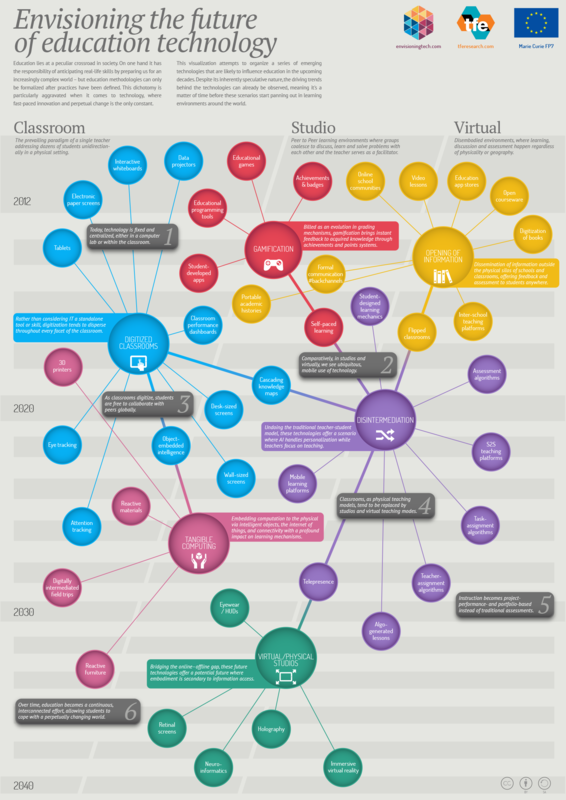 This visualization attempts to organize a series of emerging technologies that are likely to influence education in the upcoming decades. Despite its inherently speculative nature, the driving trends behind the technologies can already be observed, meaning it's a matter of time before these scenarios start panning out in learning environments around the world. Check it out and let us know what you think the future looks like.